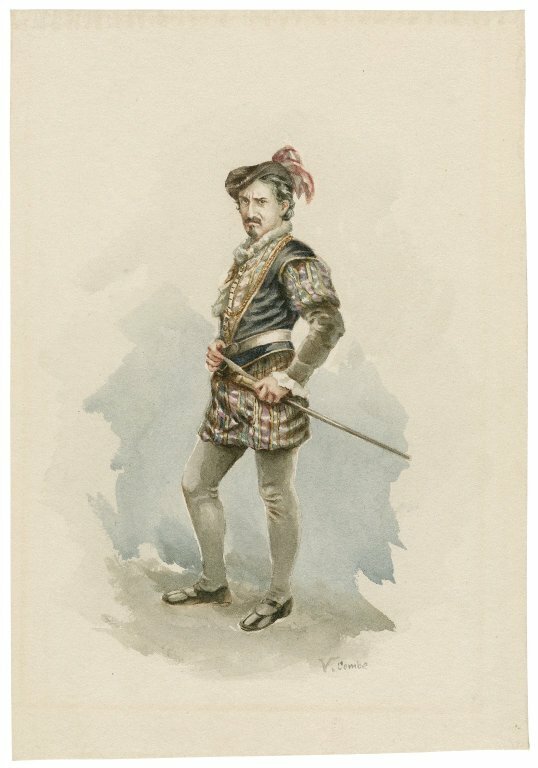 Explore a slice of the Folger Shakespeare Library’s art collection with these four portraits of noted 19th-century actors in Shakespearean roles: Edmund Kean as Richard III, Ellen Terry as Beatrice, Edwin Booth as Iago, and Fanny Kemble as Juliet. This portrait depicts Edmund Kean, the famous British actor best known for his roles as villainous Shakespearean characters. 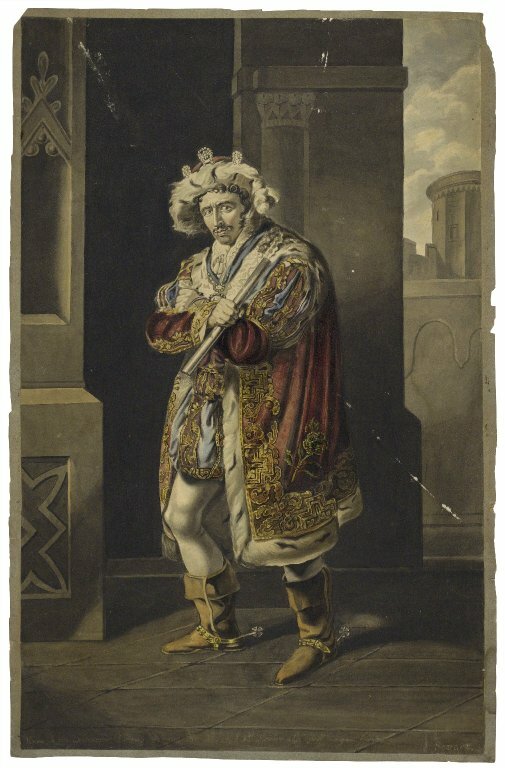 It is appropriate that he is shown here as Richard III; it was the first role he played on the stage in the United States, and it was the role that pitted him against fellow actor Junius Brutus Booth (father of Edwin and John Wilkes Booth). A transatlantic rivalry, the two actors were in warring productions of Richard III at the beginning of the 19th century. 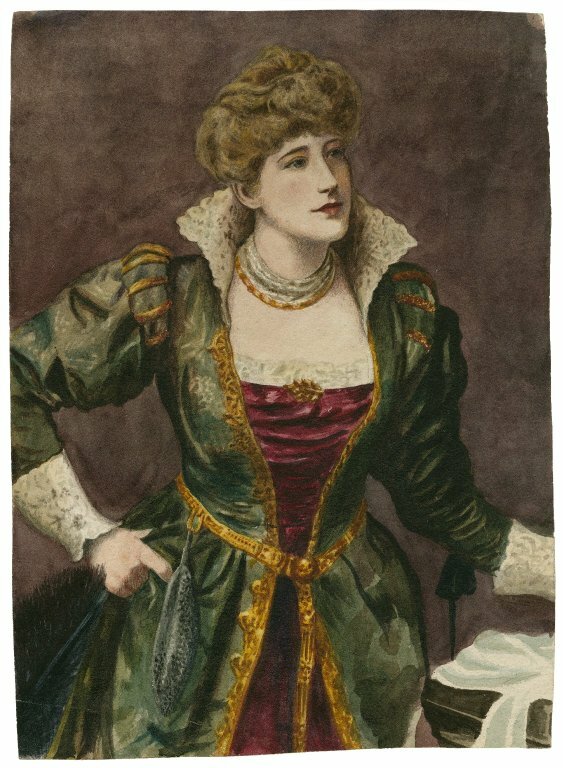 In this portrait, Ellen Terry is portrayed as Beatrice from Much Ado About Nothing. A renowned and celebrated actor in both Britain and America, her prolific career spanned roughly seven decades. She had a long-time professional partnership with Sir Henry Irving, with whom she worked on many Shakespeare productions, playing opposite him in roles such as Juliet, Lady Macbeth, Ophelia, and Desdemona. In 1882, she took on the role of Beatrice. Terry was an artistic inspiration for painters and poets of the Pre-Raphaelite and Aesthetic movements, who valued truth in nature, beauty, and a return to art as it was in the time before Raphael. The way she is depicted here—tall, graceful, with fine features and red lips dressed in a beautifully colored dress—would have been the contemporary artists’ ideal. Edwin Booth was from an acting family; his father Junius Brutus Booth and brothers John Wilkes Booth and Junius Brutus Booth Jr. also performed on the stage. He is shown here in costume. A penciled inscription on the back of this painting reads, “Edwin Booth as Iago, an unusually accurate likeness. Taken from a photograph by Gurney 1865. Voltaire Combe, 1911.” The original photograph by J. Gurney & Son is in the collection of the Library of Congress. Do you think Combe’s watercolor depicts an “unusually accurate likeness”? Fanny Kemble was an actor and writer, the daughter of actor Charles Kemble and niece of actors Sarah Siddons and John Philip Kemble. Her first role, in October of 1829 at the age of twenty, was Juliet in Romeo and Juliet at Covent Garden. 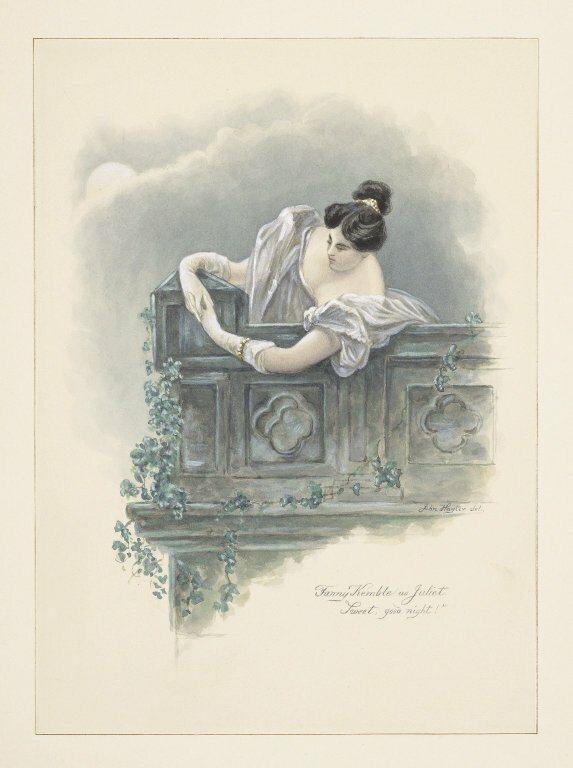 Based on the title, this is the moment in Act 2, Scene 2, when she and Romeo converse for the first time on her balcony. Notice anything unusual about the composition? Her right arm does not seem to bend at the wrist but has been elongated to curve over the corner of the balcony. Our former Curator of Art, Erin Blake, believes this is an amateur’s attempt to copy a lithograph by John Hayter. The woman in the lithograph has a bent wrist like the woman in our painting. However, while the bend in the woman’s wrist in the lithograph seems plausible, the watercolorist was not able to translate this to his painting. A copy after a lithograph would also explain why “John Hayter del.” is written formally in the lower right-hand corner of the balcony rather than as a signature. These portraits and more were featured in Kristen’s pop-up exhibition at the Folger, Spotlight on the Art Collections: Watercolors. Kristen Sieck is a Circulation Assistant at the Folger Shakespeare Library. I have a quite large collection of original portraits of actors in roles they played. Are you interested?